The past two decades have seen increased use of macroprudential policies and growing recognition of its importance among policymakers. Macroprudential policies involve a wide range of tools, to allow the targeting of systemic risks in response to identified vulnerabilities (IMF 2013, IMF-FSB-BIS 2016). However, evidence on such policies is still fragmented and largely qualitative, with no firm conclusions yet emerging on their quantitative effects and potential side effects. To provide a better foundation for the assessment of macroprudential policies, we introduce a new database of policy actions that integrates information from five major existing databases as well as from the IMF’s new global survey of macroprudential measures. This integrated Macroprudential Policy (iMaPP) database provides a comprehensive landscape of macroprudential policy, covering all instruments discussed in IMF (2014) for 134 countries from 1990-2016 (Figure 1). It provides dummy-type indices of tightening and loosening actions for 17 macroprudential policy instruments and their subcategories and detailed descriptions of each policy action at a monthly frequency (Alam et al. 2019). In addition, the database introduces an innovative feature by computing and tracking country-level averages of the regulatory limits on loan-to-value (LTV) ratios, which can be used for a rigorous quantitative assessment of the effects of these limits, thereby going beyond the estimation of effects ‘per policy action’ that has commonly been presented in the literature so far. Note: The integrated databases are Lim and others (2011, 2013), the Global Macroprudential Policy Instrument (GMPI) survey conducted by the IMF in 2013, Shim and others (2013), the database by European Systemic Risk Board (ESRB), and the IMF’s Annual Macroprudential Policy Survey (IMF survey). How are macroprudential policies used? Our iMaPP database reveals that macroprudential policies have been used extensively around the world. We document that macroprudential policies are commonly utilized in both advanced economies (AEs) and emerging and developing economies (EMDEs), even as the specific instruments used differ somewhat across country groups. The most commonly used tools in AEs are LTV limits, and while these limits are very common also in EMDEs, limits on FX positions are even more frequently adjusted, potentially reflecting differences in the main sources of vulnerability across these two country groups. We also document an important empirical pattern in the use of these policies over time (Figure 2). Policymakers tend to tighten tools when credit developments are buoyant and loosen them in response to a tightening of financial conditions, such as around the 2008 Global Crisis, as well as in the wake of the Asian financial crisis of 1997 for EMDEs. Note: A set of 63 countries with available household credit at quarterly frequency is considered. Each group-specific macroprudential index is the cumulative sum over the current and past three quarters across all countries and all 17 macroprudential tools. The inclusion of average LTV limits in our database allows us to move beyond analysis typically presented in the literature, which tends to be based on simple indicators of policy action and therefore only allows the estimation of the average effect ‘per policy action’. The new quantitative information on the size of policy changes enables us to more precisely identify their quantitative impact and to explore potential non-linear effects on household credit and consumption. We also address the main empirical challenge in identifying the causal effects of macroprudential policy, which stems from the reverse causality alluded to above, where policy reacts to the outcome (e.g., credit growth) that we want to measure, potentially leading to endogeneity biases in estimation. To address this challenge, we employ an inverse propensity-score weighted (IPW) estimator specifically designed for our purposes, in the spirit of Jordà and Taylor (2016) and Richter et al. (2018). We find strong and non-linear effects of LTV changes on household credit (Figure 3). The largest per-unit impact is found for the most popular action in our sample, a tightening of less than 10%. For actions within this range a 1% LTV tightening cumulatively reduces household credit growth by up to 0.65% after one year. The effects per 1% LTV tightening is smaller for larger LTV adjustments, likely due to policy leakage effects, and in line with the idea that the marginal effects of using any one policy tool are diminishing (IMF 2013, 2014). Notes: The figure reports the cumulative effects of a 1% LTV tightening after four quarters, obtained by the augmented inverse propensity-score weighted (“AIPW”) estimation and the fixed effects estimation with the timing assumption (“FE regression”). Confidence levels: *** p<0.01, ** p<0.05, * p<0.1. For more details see Alam et al. (2019). We also find that a given change in the LTV limit has differential impacts depending on the initial tightness of the LTV ratio cap. A tightening leads to a larger effect on consumption when LTV limits are already tight to start with (Figure 4). In contrast, the effects of tightening LTV limits on household credit growth are generally more pronounced when initial LTV limits are loose, such as when LTV measures are firstly introduced. Note: The figure shows the cumulative effects of one-ppt LTV tightening after four quarters, conditioning on the initial LTV level, estimated by the fixed effects estimation with the timing assumption. For more details see Alam et al. (2019). How can differential effects on credit (stronger when the initial LTV cap is loose) and on consumption (stronger when the initial LTV cap is tight) be reconciled? Possibly, when the LTV ratio is loose at the outset, borrowers that are facing a tightening of the permissible LTV ratio will adjust to this change by reducing the size of the loan and meeting the higher required down-payment out of their available funds. By contrast, when the LTV ratio is already tight, more borrowers may adjust to a tightening by increasing savings and reducing consumption, in an effort to attain the greater required down-payment in future. These findings are novel and document an important tradeoff. When policymakers look to tighten LTV limits that are already tight, they should be mindful that a further tightening may result in substantial side effects on consumption. Looking beyond LTV ratio caps to alternative policy tools may then result in a more efficient overall policy response. As macroprudential instruments gain prominence in the toolkit of policymakers around the world, it is becoming increasingly important to understand more precisely just how various policies work. The release of the iMaPP database provides a rich source of information for economists, policymakers, and academics seeking to fill these gaps. The rigorous examination of the non-linear effects of changes in LTV limits presented in this column is just one example of how better data can help us collectively make progress. The new iMaPP database will be updated annually with data from the IMF’s new Annual Survey on Macroprudential Policies. We hope that it will spur much further research. Authors’ note: The iMaPP database introduced in this column is available here. Special thanks go to Zohair Alam, Jesse Eiseman, and Naixi Wang. The views expressed are those of the authors and do not necessarily represent the views of the IMF, its Executive Board, or its management. Alam, Z, A Alter, J Eiseman, G Gelos, H Kang, M Narita, E Nier, and N Wang (2019), “Digging Deeper – Evidence on the Effects of Macroprudential Policies from a New Database”, International Monetary Fund, WP/19/66. International Monetary Fund (2013), “Key Aspects of Macroprudential Policy”, IMF Policy Paper, Washington. International Monetary Fund (2014), “Staff Guidance Note on Macroprudential Policy”, IMF Policy Paper, Washington. International Monetary Fund (2018), “The IMF’s Annual Macroprudential Policy Survey—Objectives, Design and Policy Responses”, IMF Policy Paper and Note to G20, April, Washington. 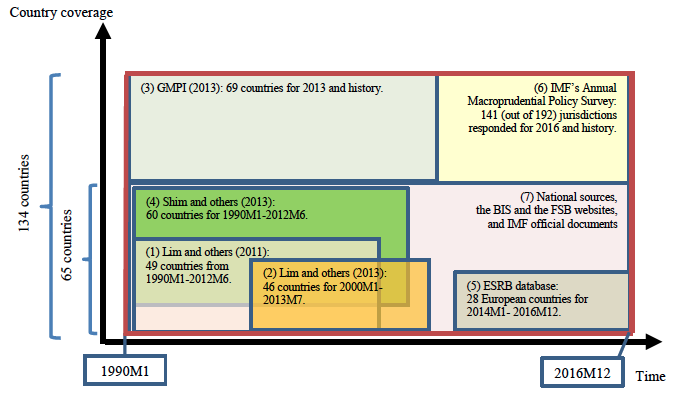 IMF-FSB-BIS (2016), “Elements of Effective Macroprudential Policies—Lessons from International Experience”, Note to G20. Jordà, Ò, and A M Taylor (2016), “The time for austerity: estimating the average treatment effect of fiscal policy”, The Economic Journal 126(590): 219-255. Kuttner, N K, and I Shim (2016), “Can non-interest rate policies stabilize housing markets? Evidence from a panel of 57 economies”, Journal of Financial Stability 26: 31-44. Richter, B, M Schularick, and I Shim (2018), “The Costs of Macroprudential Policy,” NBER Working Paper no. 24989.